We are an ISO 9002-2008 certified company engaged in manufacturing & marketing of Pharmaceutical Formulations majority of these are Non DPCO Products, and new DCGI approved molecules e.g. Tablets, Capsules, Liquids, Dry Syrups, Nutraceutical, Herbal, various advanced specialty Injectable products and World Class Packings (ALU-ALU) which interest Medical Fraternity. We have in our portfolio, a wide range of products, either different in formulations or having advance technology e.g. Rapid Release (RR) technology or having certain U.S Ps. (Unique selling propositions) which keeps our brand above the mushrooms of many "ME Too's" in the market. Altar Life Sciences — A group co. of Altar which was incorporated in 1999 as private limited Company under the indian Companies Act, l956 with an objective to market pharmaceutical formulations in different dosage forms, Right from the creation of infrastructure stage, The company kept an objective of excellence to achieve total quality management in manufacturing, marketing and customer satisfaction. 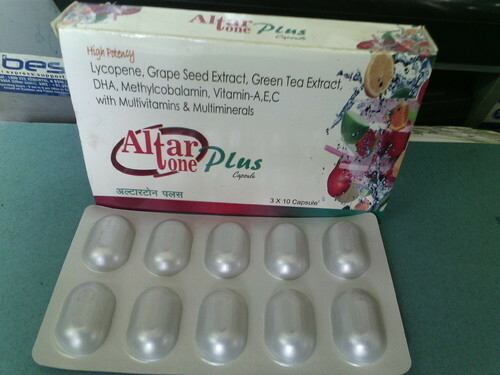 Altar Life Science a pharmaceutical company, came into existence when a group of committed dedicated and experienced professionals with background of marketing / sales and manufacturing from top Pharma national & multinational companies, joined hands together with motto of care & concern for healthy & longer life as their guiding principle. Quality, availability within the affordable reach of the patient & complete customer satisfaction are just a few mentions worthy factors that contributed immensely to our growth. We are looking for Pharma Franchise and Third Party Manufacturing queries.